Then imagine all the great opportunities you'll have to use it the rest of the evening. At the restaurant if they mess up her order, you can raise your broadsword and demand retribution. And when someone is talking too loud at the movies, simply flash your helmet and softly say, "Don't make me get my dragon." Then finally when you swoop in for the goodnight kiss, you can mention how your kingdom has been very lonely without a queen. Wait, don't use that last one. That seems a perfect line for your third or fourth date. All of which will be suited with armor, obviously. Now where are you gonna find this dashing outfit of medieval strength and handsomeness? Right here, Romeo! 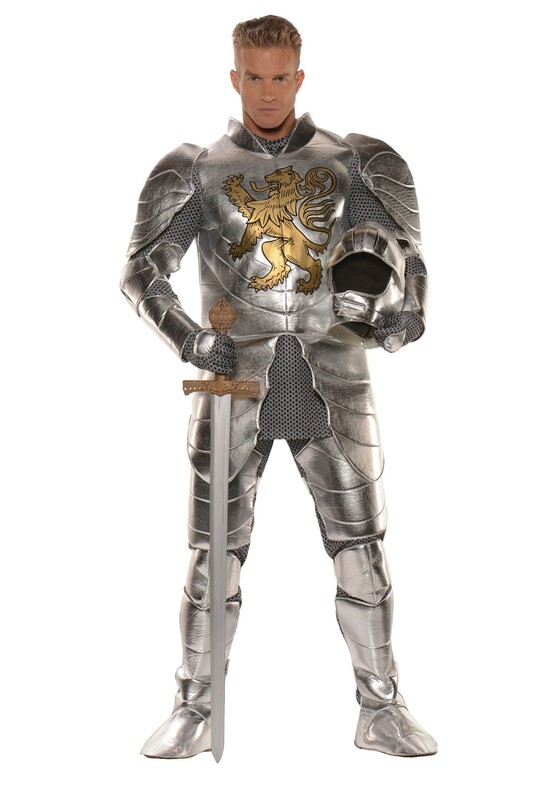 This knight costume is polyester and polyurethane foam, so you'll be comfortable all night. Everything fastens with Velcro or elastic for the perfect fit. Just make sure you check out our large selection of swords and shields so you're prepared for any sort of battle that might come up on your date and you're ready to defend her honor.